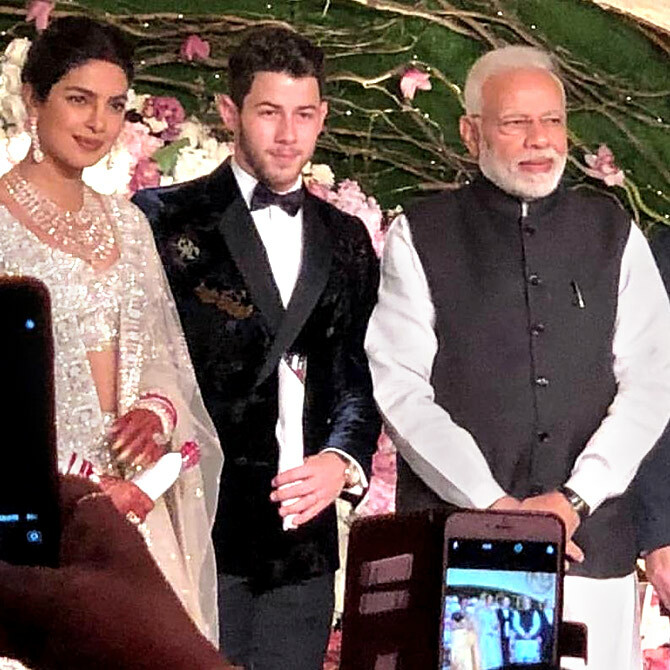 How many times has NaMo attended a movie star's wedding reception? 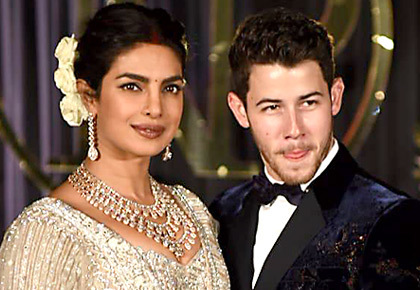 After their dream wedding, Priyanka Chopra and Nick Jonas hosted a reception in New Delhi that was attended by Prime Minister Narendra Damodardas Modi no less, besides other prominent figures from the capital, family members and close friends. After spending the weekend in Jodhpur, the newlyweds landed in Dilli for their reception at the Hotel Taj Palace. Just like the wedding, the reception was a fiercely guarded event. There was tight security around the Taj and since Modi attended the event, Delhi policemen were on their toes. The background bearing their initials -- NP at the centre -- was reminiscent of the one that featured as the backdrop of the moment the couple announced their engagement in August. 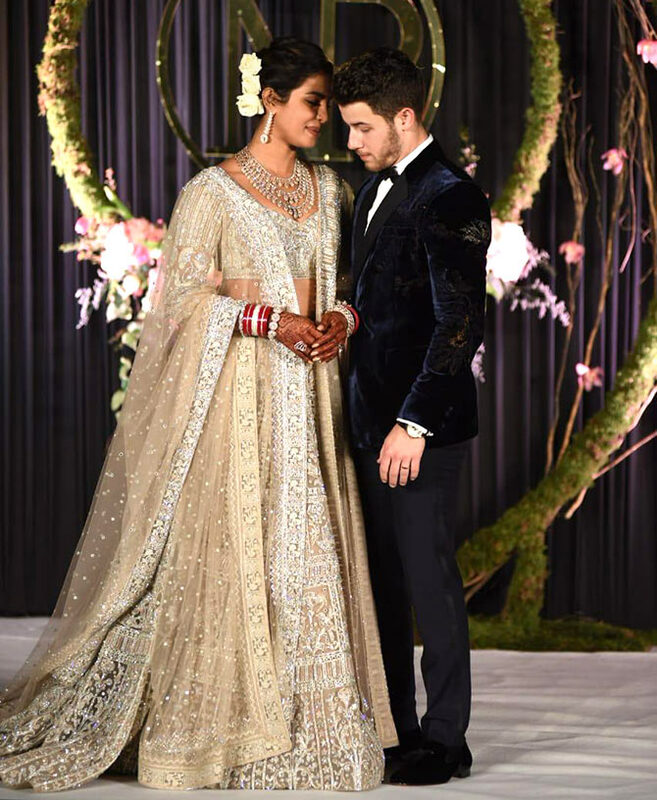 Though they arrived late, Priyanka and Nick smiled for the paparazzi who waited for more than an hour to catch a glimpse of them. Watch the video to see how the couple looked totally in love. 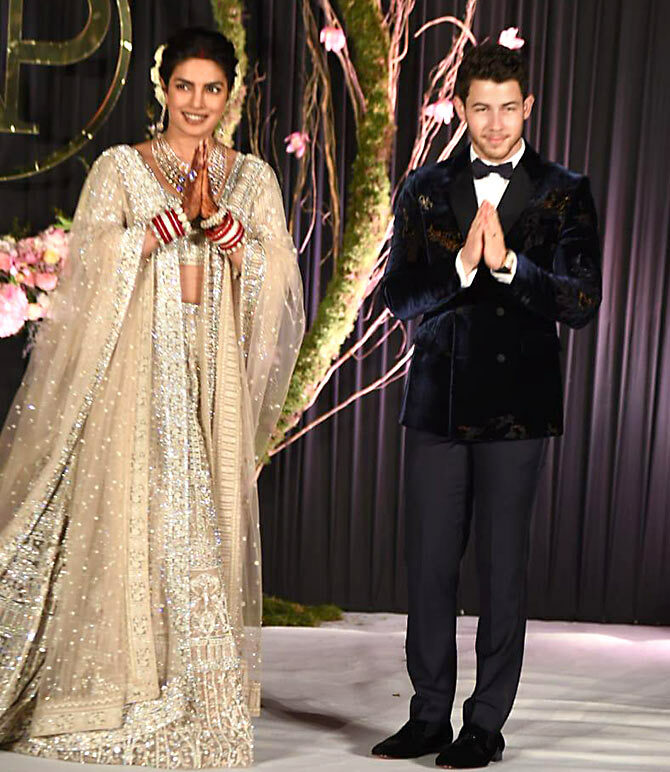 While Nick looked dapper in a velvet jacket paired with matching black trousers and a bow tie, Priyanka opted for an beige lehenga with a neatly tied bun with white roses. After striking a pose for the shutterbugs, Priyanka smiled and told the reporters, "Ab aapko family se milate hai." 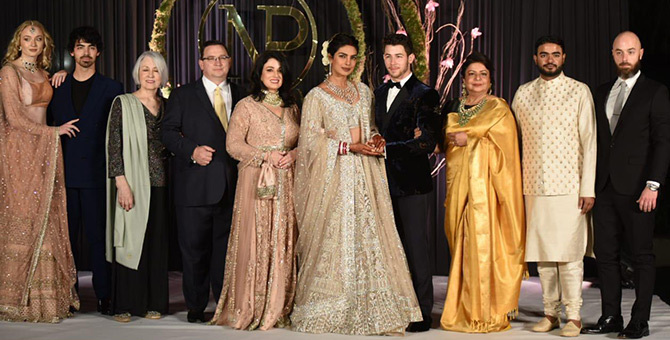 The couple's parents -- Priyanka's mother Dr Madhu Chopra and Nick's mum and dad Denise Miller Jonas and Paul Kevin Jonas Sr -- then joined the actress and the singer. Nick's brother Joe and his fiance Sophie Turner were also present at the photo-op. 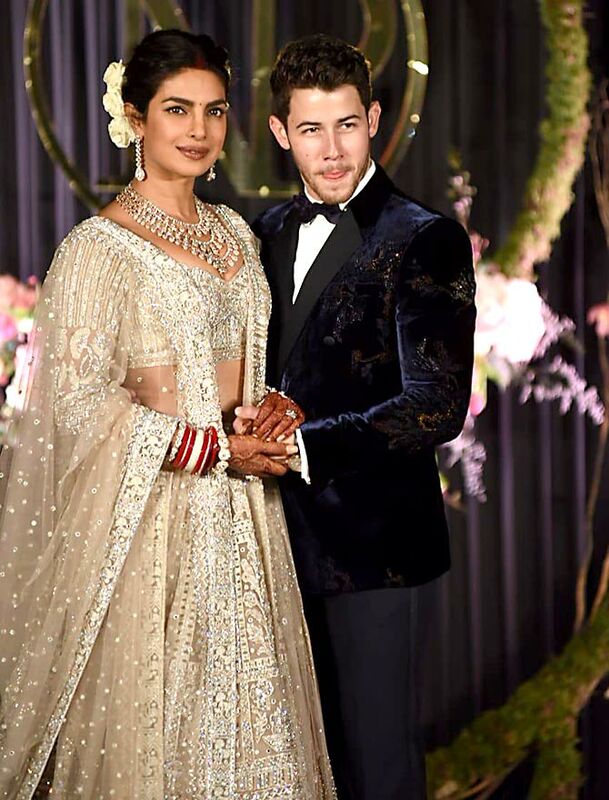 Sophie, the Game of Thrones star, who opted for Indian attire for the entire wedding weekend, continued her tryst with Indian traditionals. 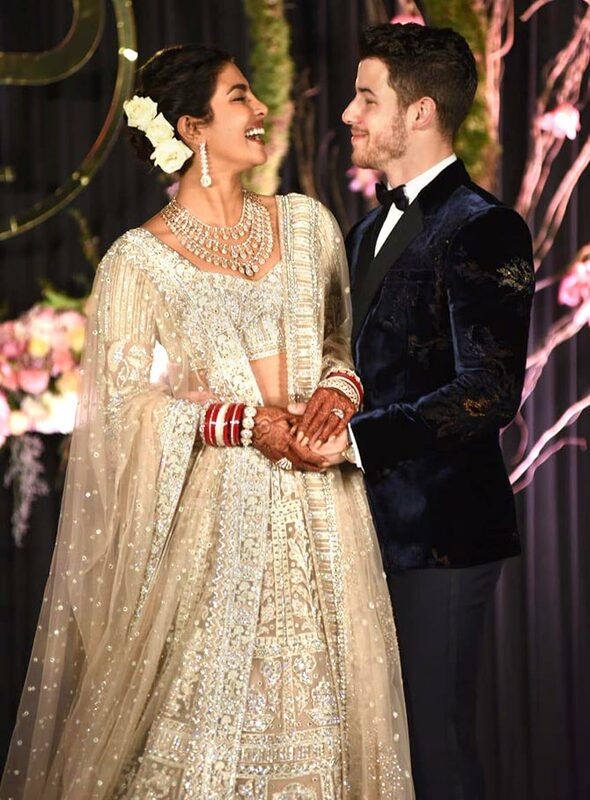 She opted for a peach lehenga while Joe donned a blue and black semi-formal suit. 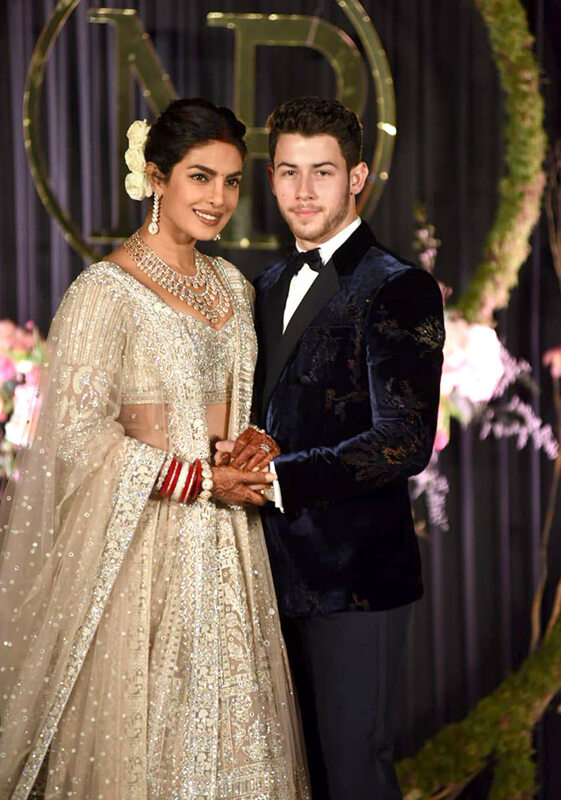 Priyanka and Nick exchanged wedding vows on December 1 at Jodhpur's majestic Umaid Bhawan Palace in a Catholic ceremony officiated by the groom's father. It was followed by an equally grand wedding as per Hindu tradition on December 2. 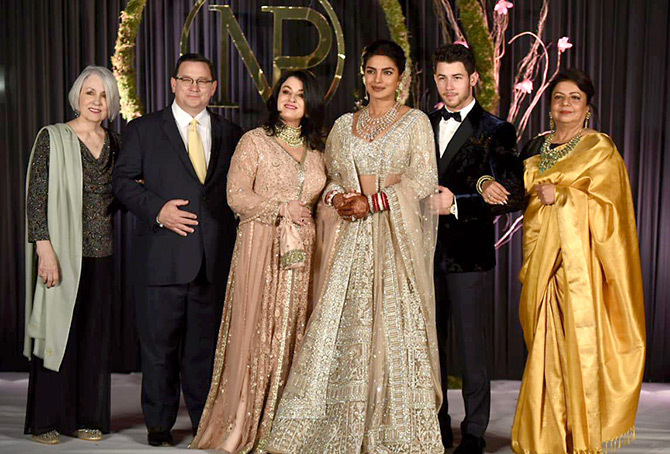 Priyanka and Nick with their families.